Not sure what size dance floor you need? We can help. In Tents Events can provide solid, attractive dance flooring for small, intimate events and large parties alike. 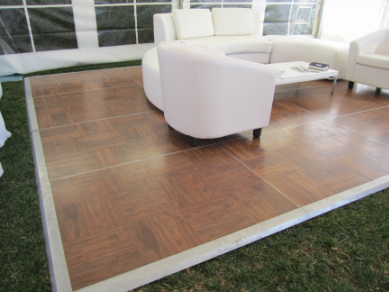 Our modular surfaces are built from 4 x 4 inter-locking panels enabling you to achieve the perfect surface for your event no matter what size. Our dance floor surfaces can be constructed over dirt, grass or concrete, enabling you to use virtually any level area as a dancing environment within one of our beautiful, top-quality tent structures. Call us today to explain your dance floor requirements. We pride ourselves on meeting the most demanding customer specifications.